DESCRIPTION: Kit includes all items needed to quickly create and seal 10 complete roof pipe penetration seals, without making any additional roof penetrations. Molded plastic interlocking curbs are quick and easy to assemble. Design allows retrofitting around existing pipes. 10 Pair (20 pieces of 1/2-round curbs), 3" ID. 8 Tubes 10.1 Oz. 1-Part Pourable Sealer. Larger Sizes: 4" , 6", and 9" ID Rounds. Chem Link E-curbs 6-inch Id Round Pipe Flashings, Complete Kit. Kit Has 3 Pair (6, 1/2 Rounds) 6 Inch Id Injection Molded 2-piece Interlocking Curbs, 2 Pouches Of 1-part Pourable Sealer And (2) 10-oz Tubes Of Gray Color M-1 Sealant. Price/kit. Chemlink E-curbs 9-inch ID Round Pipe Flashing Curbs, Complete Kit. 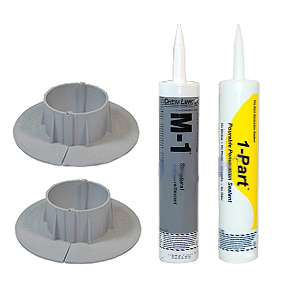 Kit Has 2 Pair 9-inch ID Gray Color Injection Molded 2-piece Interlocking Pipe Flashings, 2 Pouches Of 1-part Pourable Sealer And (2) 10-oz Tubes of Gray Color M-1 Sealant. Price/Kit.